Our horses are looking for love: Will you be their Valentine? Will you join our fantastic supporters who are prepared to sponsor one of our horses at Stilemans or fostered out, waiting to be re-homed? All it costs is £250 per annum to be a named sponsor and to know you are helping secure that horse’s future. You can download a sponsorship form here; or you can simply sign up on-line and save £10! 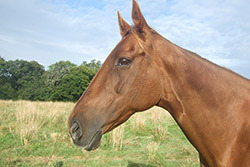 Elegant lady is one of the horses seeking a sponsor. Graham is also looking for a foster home for this lovely lady, and his appeal on Facebook was shared over 100 times and viewed by an amazing number of those of you who use social media. So please share our posts to get the message about our work out there. Valentine’s Day and thoughts of love and companionship remind us how important sponsorship is for funding the welfare of the horses in the care of the Sanctuary. In these difficult times though, not everyone can afford the £20 per month to support a Sanctuary horse, or even the £10 per month to become a member of our Supporters' Club. So we are offering the chance for you to become a Friend of The Racehorse Sanctuary by committing to donate just £3 per month to help our work looking after these wonderful horses. To sign up at this level of donation simply follow and adjust our Sponsor's instructions on-line. Ready for a challenge? Want to make a difference? 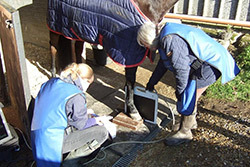 Want to show our horses you care? Well, here is your chance to do good all round! 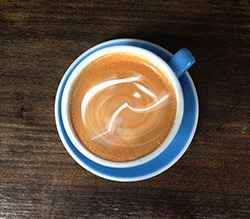 Give up a Latte for Lent and donate the money you save by texting HORS20 £3 to 70070; do not forget to respond YES to a text asking if you are eligible to Gift Aid your donation. A Starbucks a day over the 40 days of Lent adds up to nearly £120 and a whopping 7,600 calories! Save those calories and share those savings with the horses you love. Sums over £10 can be donated through our JustGiving page. Bring your friends to our Charity Raceday celebrating both the 10th Anniversary of The Racehorse Sanctuary and the 51st running of the National Spirit Hurdle at Fontwell Park. This important event not only offers a fantastic day out at a surprisingly modest cost, it is critical to our fundraising for the year, so please support us. As well as enjoying the racing from a private room with panoramic views over the racecourse, you will enjoy a champagne reception, lunch with wine, a compered charity auction and afternoon tea; see here for full details. In ten years the Sanctuary has had a fundraising event every year on the occasion of the National Spirit Hurdle and in that time, the fixture has not had to be cancelled once because of the weather. One of the lots in our Charity Auction is a fantastic weekend break in a beautifully converted 12th century Italian castle with a Michelin-starred restaurant. This two-night stay at Castello del Nero in the undulating hills of the Chianti region of Tuscany, with return flights for two adults, comes to us courtesy of Scott Dunn. All the horses remain in good health, despite the unseasonably wet and mild Winter weather; how thankful we are to be on well-drained sandy soil! We have not had to call on the Emergency Veterinary Fund this month as a result of any crises. There are two heart-warming stories to tell though. Despite showing signs of lameness, which caused consternation at first, Wavertree Warrior was found to be growing out of his special shoes. In order to find out exactly what is going on the vet took a new set of x-rays. The results were very positive. Warrior’s pedal bone has ceased rotating and seems to have stabilised, hence his muscle structure and surrounding bones are beginning to adapt and cope with the changes. This was so encouraging that the specialist farrier Richard felt that the time was right to move on from the clogs and nail on some performance leverage reduction shoes, the idea being to remove any form of frog contact which due to the foot growth beneath the clogs was beginning to cause him some discomfort. The following day he was definitely feeling his new shoes and walking very tentatively anticipating pain but as time goes on he is constantly improving. At present Warrior looks a picture and certainly hasn't lost his zest for life, he really is the perfect patient and a cracking little horse to boot. 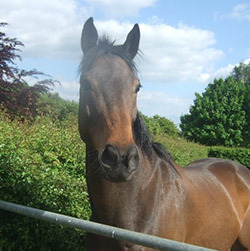 The other great piece of news is that BK, The Betchworth Kid, has been found a new foster home near Edenbridge in Kent. BK will be fostered by an old friend of Graham’s whom he trained in dressage for several years; this lady now has her own super yard with fantastic facilities. BK will be ridden and produced by her head girl, Haley, who is trained twice weekly by another friend of Graham’s, a List 2 dressage judge. This placement is part of a new strategy by the Sanctuary to look to foster horses with experienced equestrians, who are able to contribute to the re-training of their change and hence enhance their chances of finding a long-term home with a new career. Recently, horse photographer Emma Hughes spent a morning with us at Stilemans taking shots of several of our inmates including:Zelensky - aka Zelly; Eastern Scarlet - aka Harry; Secret Jewel - aka Sweet Pea; Olympic Express - aka Olly; and Repton - aka Tony. All behaved extremely well and needless to say both Harry and Olly took full advantage of the situation and did what they do best, posing enthusiastically. Emma also took some fun shots of Second Paige - Sprout - playing with the hose pipe. Emma is kindly donating the pictures to the Centre to be used as either auction items or prizes at any of our functions and will also take a professional picture of any horse that is sponsored to give to the person sponsoring. A percentage of the profits will also be donated to the centre for any individual photos sold at our events. Emma has also generously donated a private photo shoot of a horse or family pet for us to use as an auction item. Do check out Emma’s website as she is a very talented lady; see: www.horsephotographeruksurrey.co.uk. 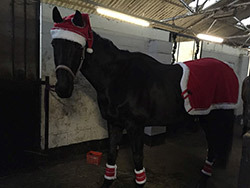 Huge congratulations to all three horses and their keepers, also to all others who sent festive pictures of their horses. © 2019 The Racehorse Sanctuary. All rights reserved. Designed and Donated by: Racecar New Media.